This past week has been rough. At the end of last week, my family's dog, Tink, suddenly wasn't doing so well and we had to put her to sleep. I cried almost all day at my desk at work, felt depressed over the weekend and mainly just stayed in my apartment, and since then have been having random bursts of crying moments. Tink was old, but losing a pet is always so hard. It's sad to think that she won't be there when I go home to Connecticut anymore, sitting with us in the living room on someone's lap, and barking for food when we ate dinner. I'm not sure if it's the weather, losing a pet, or just general stress/having a stomach bug a couple weeks ago, but I haven't been feeling very inspired about food lately. The food photography workshop I signed up for in Northern California is about a month away and I'm really looking forward to it, so I hope that it will trigger me to be inspired! I'm headed to Boston this weekend to visit a friend and hope everyone has a great weekend! For the crust, combine flours, cocoa powder, confectioners sugar and salt and spices. Add the butter cut in small pieces and whisk with a fork to form crumbles. Add the egg and the vanilla and stir to combine. Add ice water by the tablespoon until dough forms. Form a disk, cover with plastic wrap and refrigerate for at least 2 hours. Preheat oven to 350 °F and prepare a 9-inch springform tart pan or small pans. Place the dough onto a floured countertop. Roll it out with a rolling pin, turn out into the prepared pan (or pans) and form an even, flat crust layer. Bake for 15 minutes. Allow to cool on a rack for about 15 minutes before removing from the springform pan and adding the filling. 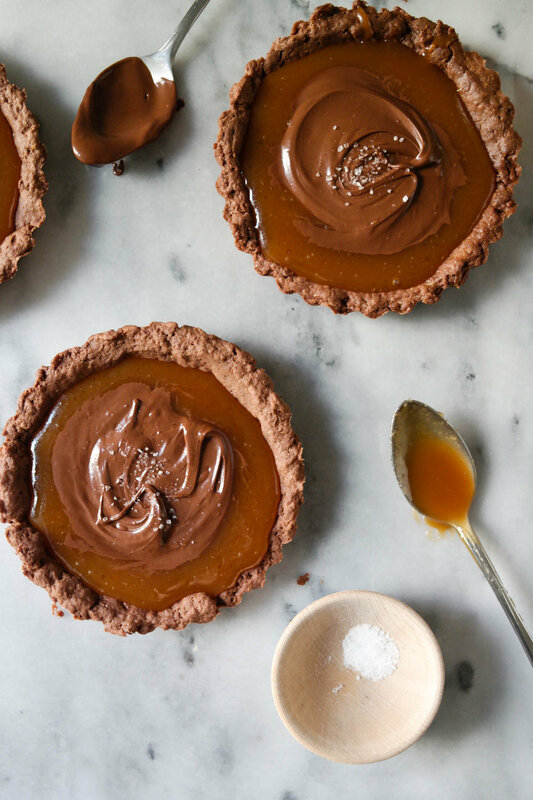 After the crust has cooled pour salted caramel over the crust and smooth the top lightly with a spatula or offset knife. To a medium bowl add the chocolate chips and melt them in the microwave by heating for 10-15 seconds intervals. Pour the chocolate over caramel, let rest for about 15 minutes, then slice and serve.